Intro: Excited for the visit of her friend Sunburst, Starlight Glimmer meets him at the train station and is surprised when he suggests going to an antique store. Act 1: Sunburst and Starlight bump into Twilight Sparkle at the antique store. Sunburst and Twilight bond in the store and afterward while comparing purchases, while Starlight is bored. All three enjoy a dragon game from Starlight's childhood, but that night Sunburst only expresses enthusiasm for spending time with Twilight. 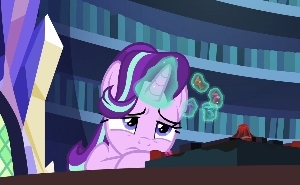 Act 2: Starlight brings Sunburst out from the castle before Twilight wakes up, and they happen upon Trixie, with whom Sunburst immediately connects over their love for magic tricks. Starlight then shows him the mirror pool and they find Maud, whose interest in geology Sunburst shares. Starlight then uses a spell to simulate her childhood playtime with Sunburst, which greatly bothers him. Act 3: Sunburst expresses concern to Twilight over his inability to find common interests with Starlight. He seeks the advice of Trixie and Maud, and they all surprise Starlight at the castle with a life-size re-creation of the dragon game. Starlight is touched, and all the friends see Sunburst off at the train station. On the train, a mysterious book is seen among his purchases from the antique store. Character: Remember Griffon the Brush Off, where one of Rainbow Dash's old friends refused to connect with Dash's new friends? Here we have the opposite extreme, as Starlight Glimmer's old friend bonds more with Starlight's friends than with her. The main character setup for this episode is similar to No Second Prances; in both cases we have three imperfect ponies, each one trying to do the friendly thing but stepping on one another's hooves while doing it. 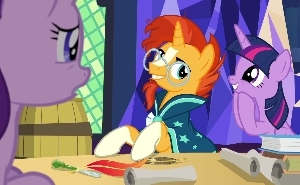 In the true MLP tradition of bucking stereotypes, Sunburst gets his best presentation to date as a sociable intellectual, highly knowledgeable but with a variety of interests. For much of the episode, it seems he's trying to be a friend to Starlight by joining her circle, getting to know her friends as they're introduced to him. But he gets carried away with all the chemistry and is oblivious to how much it bothers Starlight until she runs off in tears. However, he's quick to lock onto the problem and needs only a minimum of coaching from Twilight to seek out a solution. Starlight is the victim in all this. Though once trepidatious about reconnecting with Sunburst, she's now giddy with excitement over his visit, but neither she nor Sunburst have given any specific thought to just what they have in common. They "did everything together" as foals, Starlight once said, but a board game is all she can come up with as a shared activity. Even magic only comes up as an afterthought. It's very realistic: Our childhood memories are hazy and usually center around a few stand-out events from any given year. I had friends I spent every day with in my elementary years, but what exactly did we do together? Play and go to school, I guess. I have no idea how well we would get along now in our forties. Her resorting to a sort of time-travel-simulation spell (and the impulsive and pushy way she goes about it) is true to form for Starlight. It's good that she recognizes her misstep with that, but her ability to create a magic-based holodeck of sorts is an idea I'd like to see explored again. Twilight Sparkle forgets herself over her commonalities with Sunburst—understandably so, since she's had so few friends like herself. But after that first day, the Princess Of Friendship is the one with the perspective to recognize the issue. I like the fact that she hits on it so immediately: "Why would Sunburst be doing any of that? I thought he came to Ponyville to see you." After that line, the story turns a corner and is now about solving the problem, though the solution is elusive until the end. And as much as I enjoy Twi's interactions with Sunburst, it's also fun to see Twilight bonding at the end with Trixie, Maud, and Starlight, three ponies who took a while for her to get close to. For Trixie and Maud (as well as Twilight), there's never a hint that they're trying to steal Sunburst away from Starlight in any sense. By all appearances, they're trying to do the friendly thing when you're introduced to somepony. From their standpoint, they can all just be friends together, and it may seem like Starlight's being oddly standoffish even as she feels pushed to the side, much like Pinkie Pie when Cheese Sandwich came to town. Speaking of Maud, her presence in this episode recalls her introductory story, where we saw that if you can't find anything in common, you can perhaps bond over your affection for someone you both love. Uncommon Bond provides a good counterbalance to that: If you're not careful, somepony can end up feeling like a fifth wheel. It's fun for us and healthy for Starlight to have more time with ponies outside the Mane Six, though we're left with no explanation of where Spike and the rest of the gang are. By the way, if you've gotten the impression that season seven features more main character non-appearances than previous years, you're right. Even counting photographs and other cameos, Twilight, Applejack, and Pinkie Pie were each absent from nine episodes this season, Rarity from ten episodes, Rainbow Dash from eleven, Spike from twelve, and Fluttershy from fourteen, a record high for every character, for a whopping 74 total absences. (Starlight was in exactly half this season's episodes, if you're wondering.) I believe this is the result of greater focus on character pairings, supporting characters, and traveling outside Ponyville. Lesson: The primary moral of Uncommon Bond is Sunburst's to learn, and it's summed up in Twilight's question to Starlight, quoted earlier. When you're invited to visit a friend, you're there for that friend, not just there to enjoy whatever or whomever you see on that visit. It's a lesson I learned as an adult. In college I was far from home so I spent breaks at my grandparents' farm, but I neglected to spend much of that time WITH my grandparents. The farm was where I happened to be, and I watched TV, read, and played video games when I'm sure they would have enjoyed more chances to play, talk, and even do farmwork together. Now I know better, and when a friend recently invited me to have dinner and see the new Star Wars movie, I enjoyed the food and the film, but I kept in mind his intent in including me in his evening activities. This is a fine lesson to learn as a kid, when you're going over to friend's houses and learning how to socialize, so I'm really glad this is in the show. 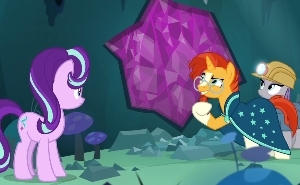 The second lesson is masterfully implied by a wordless pan shot of Starlight's friends during the life-size Dragon Pit game: Allowing everypony to just enjoy time together moves us beyond the competition of who's a closer friend to whom and makes us into a team or a small community. Resonance: While there are some light bits of drama and a few moments of hilarity, I see Uncommon Bond as a nice, sunny walk in the park, just enjoying the characters and their ups and downs with one another. 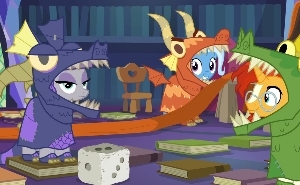 The animation provides a lot of little subtle moments: Starlight's spoon-spinning, Trixie's little head-shakes during the card trick, the implication that Boulder has cloned himself, the half-lidded eyes on Maud's dragon costume, and a split-second cameo of Ms. Peachbottom at the train station. The constant reuse of the same montage music is a funny way to drive home the monotony Starlight feels during Sunburst's bonding scenes. Other Impressions and Final Assessment: Story editor Josh Haber was at the Ponyville Ciderfest convention in Milwaukee when this episode premiered, and he explained that this is really Kevin Lappin's story. At Hasbro's suggestion, Haber added the Trixie and Maud subplots to give the characters more to do and, likely, to keep this from seeming like a love triangle. This late in the series, as you can tell by this review, stories are really building on one another, and the lessons and character moments often recall similar ideas in previous episodes. But very few entries feel like retreads; there's always a new twist, and especially this season, a more mature or nuanced handling of a lesson that was addressed in a simpler form in previous years of the show. I think that's part of what's kept the series fresh while still being true to itself, growing along with its viewers. To sum up, this is a mildly pleasant episode with no problems to speak of, with a gentle but effective take on a lesson that's relevant to both kids and adults. Though not as flashy as other later episodes, it well reflects the series' maturity in its writing. I rank it alongside three other excellent episodes: Flight to the Finish, The Saddle Row Review, and Triple Threat.